Looks like a painting. Thanks. 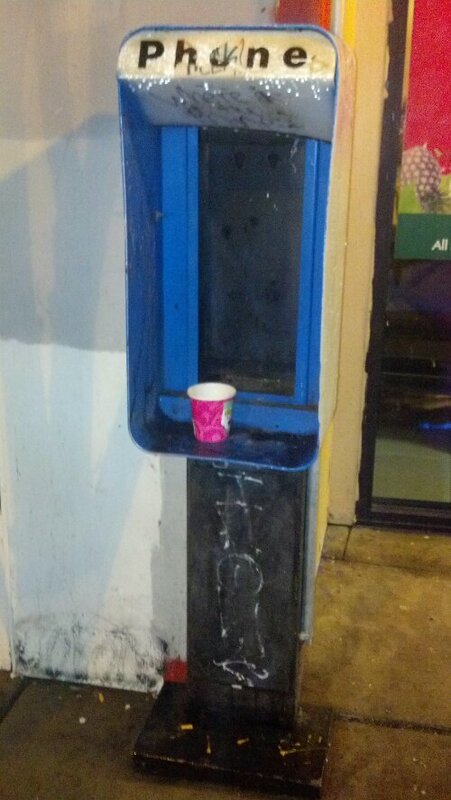 Clearly the phone is out of order: there is no string knotted to the bottom of the cup. Write a short story in which the main character, who doesn’t even drink coffee, tries to place a call to Gwynedd, Wales, only to find out (too late!) that all long distance calls require an espresso cup. It’s a stringless model. You punch out the bottom of the cup and use it like a megaphone. They say that on the night of the full moon, you can still hear it ringing… ringing…. I tried to use that phone once during a personal crises. Saw the booth down the block and used the last ounce of strength to get there, hoping to get some help. Maybe I would have called my wife, my priest or therapist; possibly the police. Nothing there but an empty cup. That was when things started going downhill.